To complete the Sports Complex, 103 acres of existing runway were removed, generating 100,000 tons of material that was crushed and re-used within the project site. Over 2 million cubic yards of earth were moved to complete rough grading. Infrastructure notes: 6,000 feet of sewer main line 8” and larger; 10,000 feet of domestic water main 8” and larger; and over 4 miles of storm drain 18” through 96” were installed. Landscaping encompasses 127 acres, and included over 1,400 trees planted. 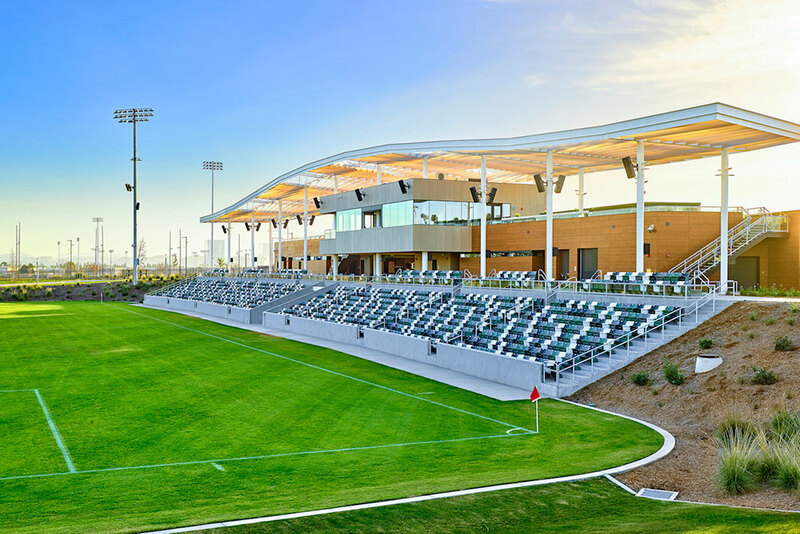 Situated in the Orange County Great Park, this multi-faceted sports and recreation complex reflects an exceptional public/private collaborative by the City of Irvine and FivePoint, developer of the adjacent Great Park Neighborhoods master-planned community. 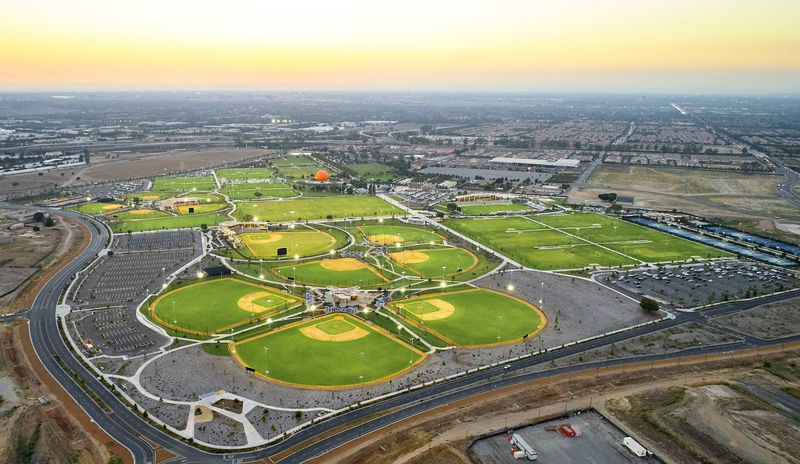 Encompassing 194 acres, the Sports Complex is the largest park west of the Mississippi, 3x the size of Disneyland. 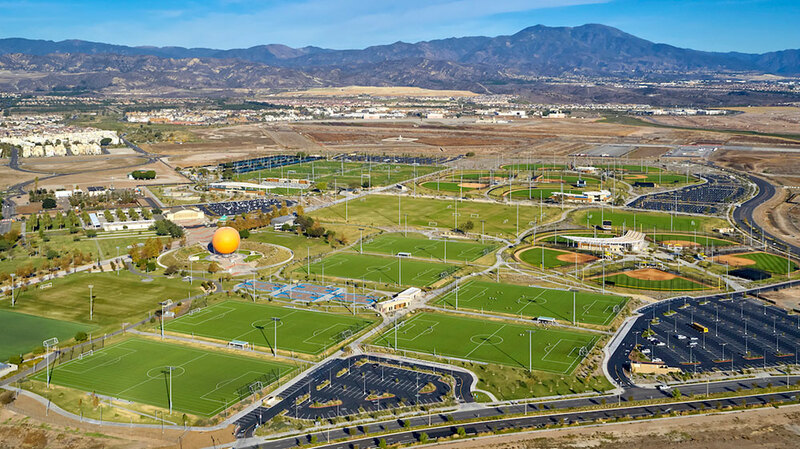 It features professional/world level facilities for soccer and tennis, and accommodates year-around club sport tournaments, easing the demands on local families to drive to Los Angeles, Riverside and San Diego counties, and other distant points for their children’s tournaments. Additionally, 12 acres of flex fields complement dedicated use fields. The soccer stadium is a mini-version of world level stadiums, and the tennis courts meet national and international tournament criteria. The Sports Complex also accommodates open play and drop-in opportunities, which expand the choices for all. Thoughtful pedestrian routes connect all interior points. Sequenced perimeter parking optimizes convenient access to all use areas. Among additional built and planned amenities and attractions: a children’s exploration playground, event lawns, pedestrian promenade, sporting plaza, pedestrian trails, bicycle paths, family barbecue area, memorial gardens, dog parks, a children’s fun zone, public respite areas and a maintenance facility. 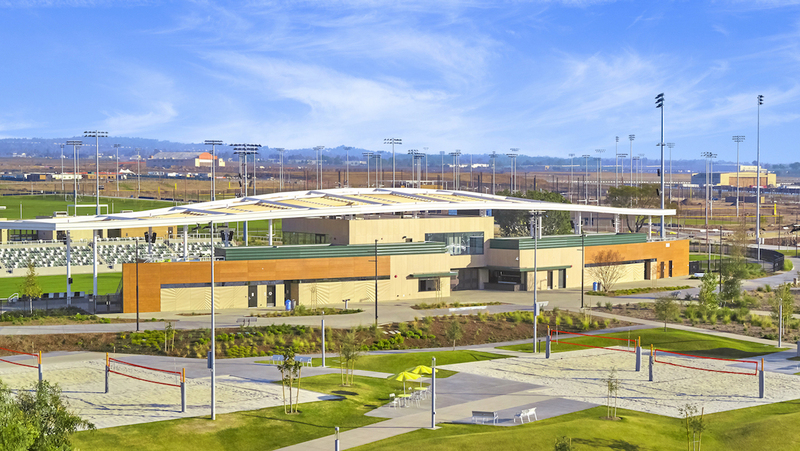 The Sports Complex is a stellar addition to the Orange County Great Park, and to the development of Great Park Neighborhoods. This 1300-acre re-development contributes significantly to the transformation of the former Marine Corps Air Station El Toro. It is deservedly recognized as a testament to positive public/private partnership, and to design and planning excellence that provides quality homes and amenities for use and enjoyment over many generations. Authentically unique design and planning make this project a stand out. Such comprehensive and centralized public sports facilities are rare in our country, and the attention to integrated design and superior functionality and connectivity has generated a totality that is at the highest level. Each building is uniquely different, yet all tie to the others. A representative special note: unique canopies for each facility help quickly identify each building’s program—an aesthetically pleasing and useful way-finding tool. Relationships Generated—The design/planning and development collaborative of Fivepoint; the City of Irvine; Hunsaker & Associates Irvine, Inc., NBBJ Architects; KPRS Construction Services, Inc.; BrightView Landscape Development, Inc. and BrightView Design merits the highest commendation. 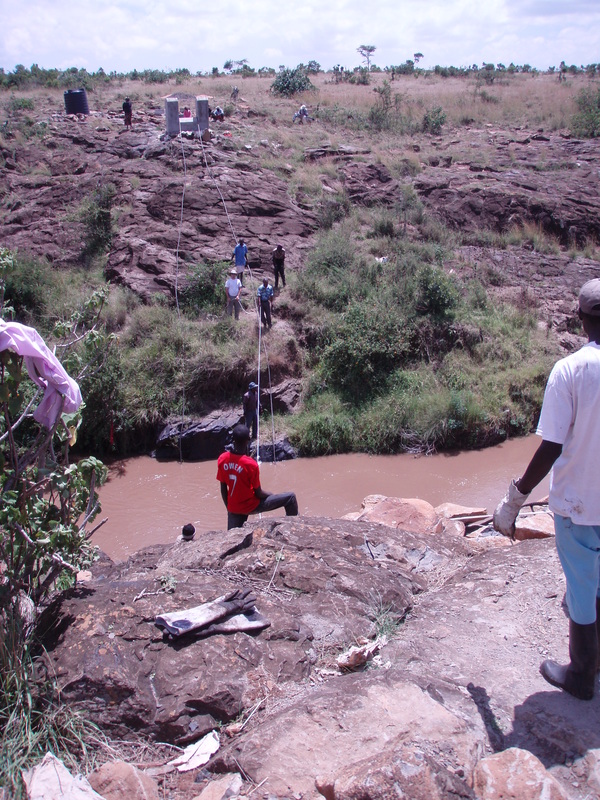 Their skills, experience and energy helped meet complex goals and surmount myriad challenges. 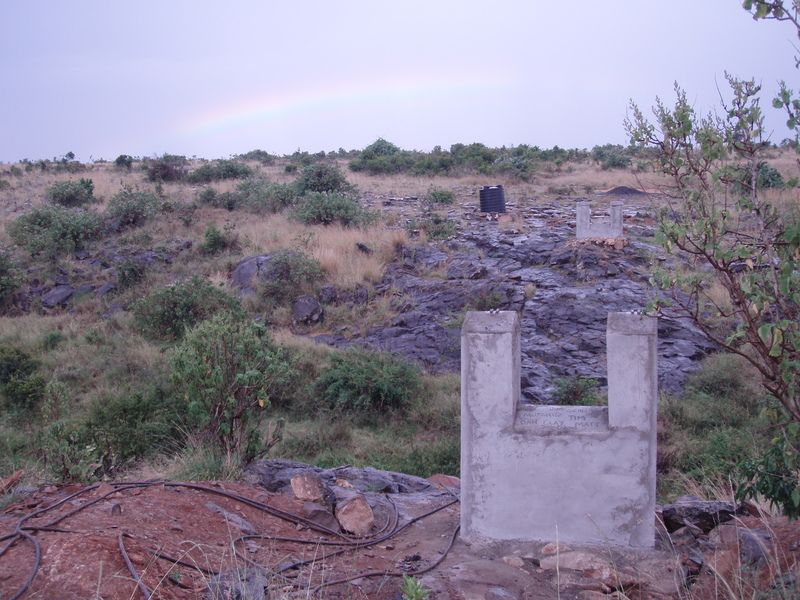 Obstacles Overcome—Accommodating existing infrastructure was critical to site development. This infrastructure included such main lines as a 24-inch sewer, 12-inch recycled water and 6’x4’ triple box storm drain running the park’s entire north to south length. It also included an existing Department of Navy extraction well system and an existing 12KV underground power line, both running the entire east to west width. The final design for field layouts and circulation has provided respective Agencies access to all of their facilities while also meeting their design requirements for protecting facilities over the long term. 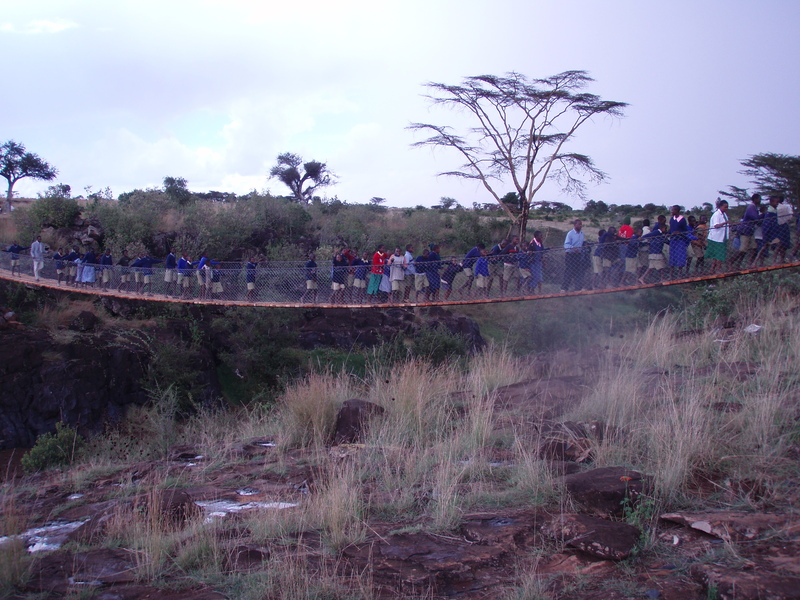 Special care was also taken to protect existing facilities during construction. The IRWD Zone B 12” Recycled Water main required a portion to be relocated to accommodate the championship soccer stadium. Also worth noting is that the existing 6’x4’ triple box storm drain structure was built for the former El Toro Marine Corps Base, and is actually 22’ wide and 7’ tall. During design development inspections, it was deemed more than suitable for continued use, since it was constructed to sustain countless aircraft landings. After the northerly piece of the storm drain triple box was removed, nearly 2,000 feet were left in place and now serve as a major storm water conveyance. This solution saved the project hundreds of thousands of dollars in storm drain construction costs. Also among memorable obstacles was a 40-day rain delay in the winter of 2016. 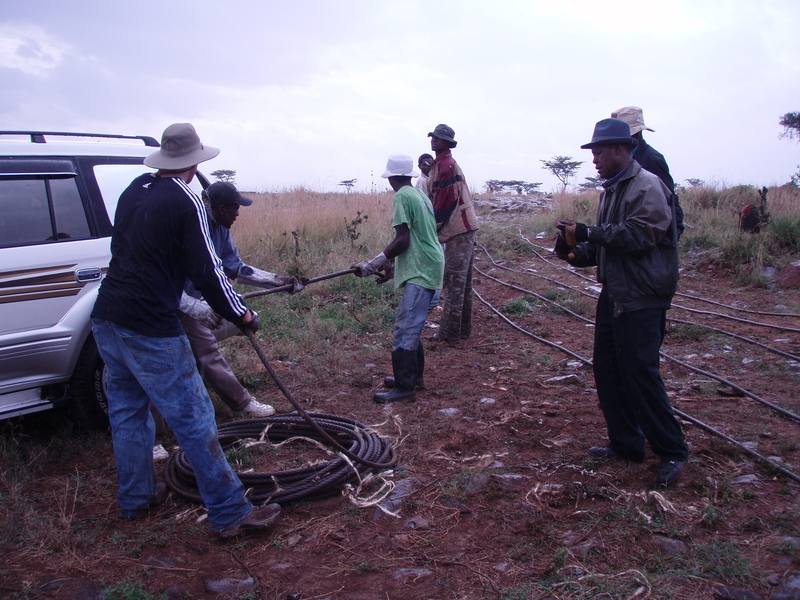 The team quickly cleaned up, pushed forward and overcame conditions that would have severely impacted most projects. All achievements reflect the extraordinary coordination and communication needed to implement a large-scale project with diverse existing conditions, multiple team components and complex scheduling. Accolades—We hope ASCE OC will be the first to honor the Sports Complex, which is new and without accolades to date. Related honors for FivePoint and the City of Irvine include the Irvine Bridge, winner of a 2017 ASCE OC award. The Orange County Great Park earned a 2018 Project of the Year designation from the American Subcontractors Association. FivePoint has earned multiple awards for residential and recreational development at Great Park Neighborhoods. 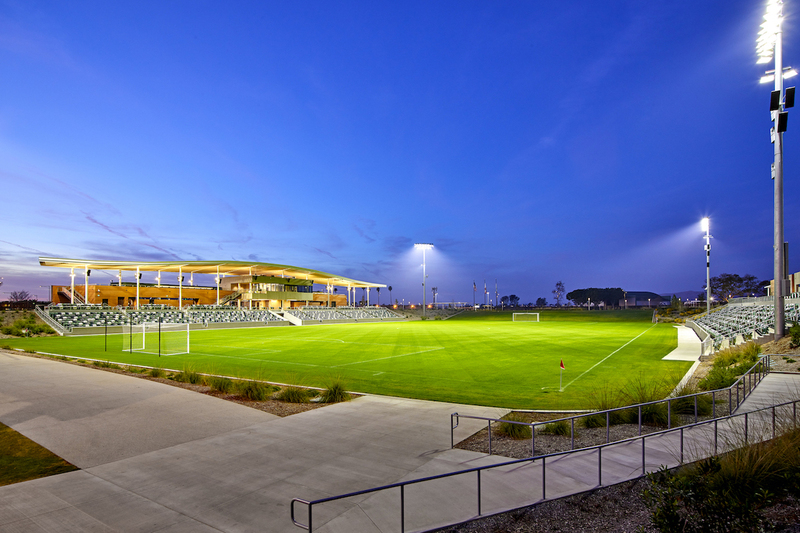 Valuable in its own right, the sports complex is also a testament to thoughtful development within and around the Orange County Great Park. Located in the geographic center of Orange County, the Great Park is easily accessible to millions of Southern California residents via freeway or railway. It embraces recreation, competitive sports and parkland. The environment preserves Orange County’s agricultural heritage and honors the history of the former air base. The Orange County Great Park joins America’s inventory of national treasures and sets a new standard for great metropolitan parks around the world. 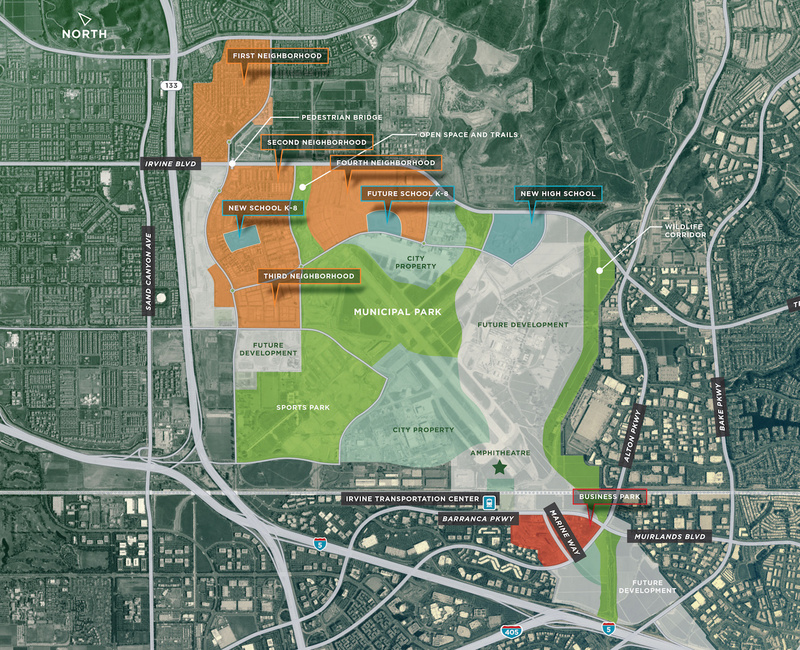 This multi-faceted complex is an unmatched sports and recreation hub that reflects the exceptional public/private collaborative by the City of Irvine and FivePoint, developer of the adjacent Great Park Neighborhoods master-planned community. 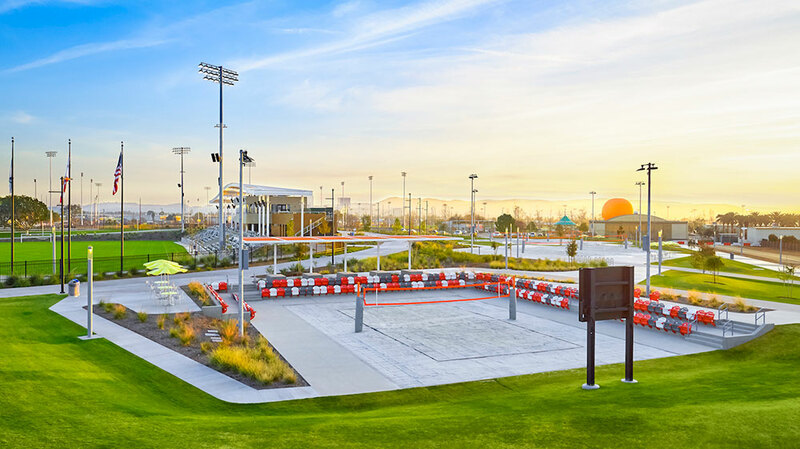 Open to all residents of Orange County, it brings new opportunities to a spectrum of sports enthusiasts, and brings an extraordinary new amenity to the Orange County Great Park. Situated in the Orange County Great Park, this multi-faceted sports and recreation complex encompasses 194 acres, and is the largest park west of the Mississippi, 3x the size of Disneyland. It reflects an exceptional public/private collaborative by the City of Irvine and FivePoint, developer of the adjacent Great Park Neighborhoods master-planned community. 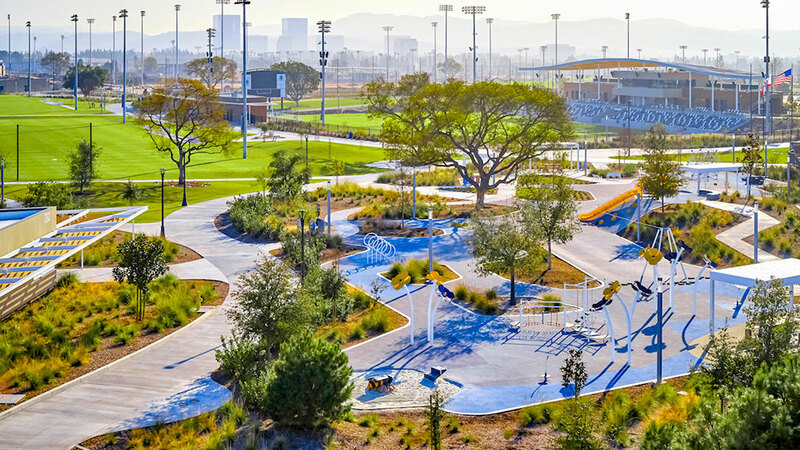 In concert with their outstanding project team of design, engineering, construction, landscaping and technical professionals, the City and FivePoint have created an extraordinary amenity for the Orange County Great Park. 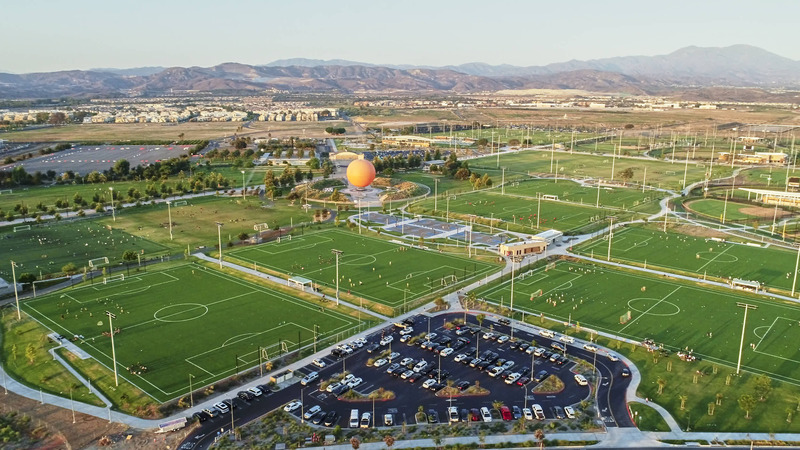 An unmatched sports and recreation hub, the Great Park Sports Complex brings new opportunities to all residents of Orange County, with fields and facilities that serve a spectrum of sports enthusiasts. Such comprehensive and centralized public sports facilities are rare in our country, and the attention to integrated design and superior functionality and connectivity has generated a totality that is at the highest level. The new sports park features professional, world level facilities for soccer and tennis. A mini-version of world level stadiums, the soccer stadium incorporates seating and amenities for 2500. Tennis courts meet national and international tournament criteria. Flex fields complement dedicated use fields that include those for soccer, baseball, softball, volleyball and tennis. Accommodating year-around club sport tournaments, the complex eases the demands on local families to drive to Los Angeles, Riverside and San Diego counties, and other distant points for their children’s tournaments. Also among built and planned amenities and attractions are: a children’s exploration playground, event lawns, pedestrian promenade, sporting plaza, pedestrian trails, bicycle paths, family barbecue area, memorial gardens, dog parks, a children’s fun zone, public respite areas and a maintenance facility. In addition to scheduled uses, the park accommodates open play and drop-in opportunities that expand choices for all. Thoughtful pedestrian routes connect all interior points. Sequenced perimeter parking optimizes convenient access to all use areas.